Bigelow® All Natural Classic Green Tea.America's classic.Family tea blenders since 1945.Our signature green blend enlivens the earthy flavors of this delicate tea.Healthy antioxidants.40 tea bags wrapped in foil pouches, freshness stays in.Air and moisture stay out. 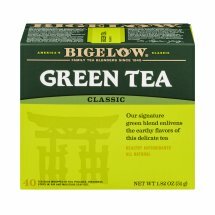 Bigelow® All Natural Classic Green Tea. Family tea blenders since 1945. Our signature green blend enlivens the earthy flavors of this delicate tea. 40 tea bags wrapped in foil pouches, freshness stays in. Air and moisture stay out.